Humans don’t start their thinking from scratch every second.Lets say you are thinking about something most of the time your thoughts are related to past events and thats how humans process sequential data. Traditional neural networks can’t do this , and it seems like a major shortcoming.For ,example imagine you want to classify what kind of event is happening at every point in a movie.It’s unclear how a traditional neural network could use its reasoning about previous events to inform later ones. So what is a Recurrent Neural Network? 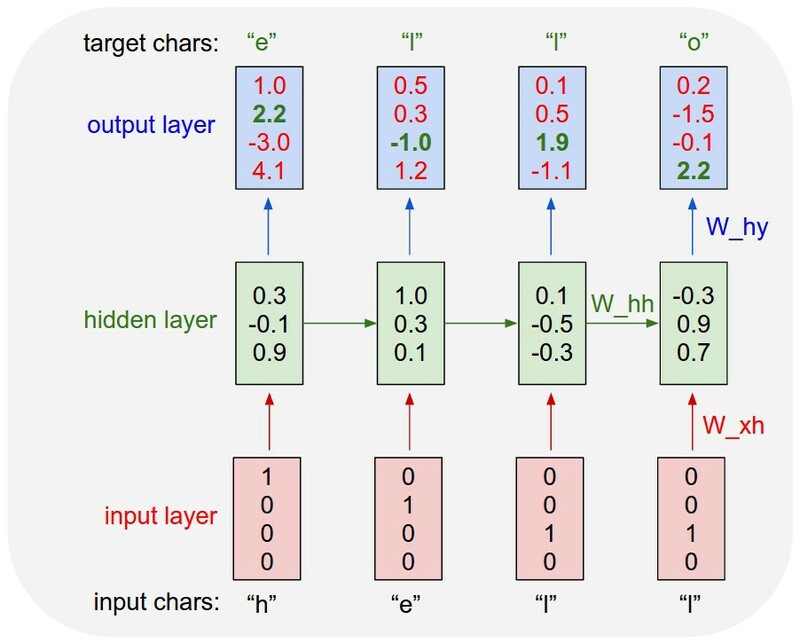 A Recurrent Neural Network is an extension of a conventional feedforward neural network ,which is able to handle a variable-length sequence input.The RNN handles the variable sequence by having a recurrent hidden state activation whose activation at each time is dependent on that the previous time. where ϕ is a nonlinear function such as composition of a logistic sigmoid with an affine transformation .Optionally ,the RNN may have an output y=(y1,y2,….yT) which may be of variable length. 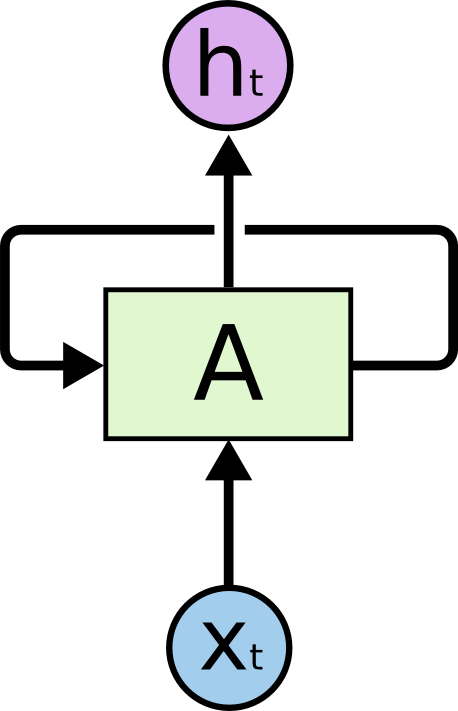 In the above diagram , a chunk of neural network,A ,looks at some input xt and outputs a value ht .A loop allows information to be passed from one step of the networks to the next. Sequence output for example we feed an image into an RNN and it outputs a sequence of words. Sequence input for example we input a sentence “There is nothing to like in this movie” and it outputs a rating or review for example 1 out of 5 stars which is called sentiment analysis. Sequence input and sequence output for example machine translation reads a sentence in english and outputs a sentence in french. Notice that every case are no pre-specified constraints on the lengths sequences because the recurrent transformation (green) is fixed and can be applied as many times as we like. The above specifies the forward pass of a vanilla RNN. This RNN’s parameters are three matrices W_hh,W_xh,W_hy. The hidden state self.h is initialized with the zero vector. The np.tanh function implements a nin-linearity that squashes the activations to the range [-1,1]. Notice briefly how this works: There are two terms inside of the tanh: one is based on the previous hidden state and one is based on the current input. In numpy np.dot is matrix multiplication .The two intermediates interact with addition , and then get squashed by the tanh into new state vector. We initialize the matrices of the RNN with random numbers and the bulk of work during training goes into finding the matrices that give rise to desirable behavior , as measured with some loss function that expresses your preference to what kinds of outputs y you’d like to see to your input sequences x.
We’ll train RNN character-level language models.That is , we’ll give the RNN a huge chunk of text and ask it to model the probability distribution of the next character in the sequence given a sequence of previous characters.This will allow us to generate new text one character at a time. An example RNN with 4-dimensional input and output layers, and a hidden layer of 3 units (neurons). This diagram shows the activations in the forward pass when the RNN is fed the characters “hell” as input. The output layer contains confidences the RNN assigns for the next character (vocabulary is “h,e,l,o”); We want the green numbers to be high and red numbers to be low. For example , we see that in the first step when the RNN saw the character “h” it assigned confidence of 1.0 to the next letter being “h”,2.2 to letter “e”,-3.0 to “I”,and 4.1 to “o”.Since our training data (the string “hello”) the next character is “e” , we would like to increase its confidence(green) and decrease the confidence of all other letters (red).Similarly , we have desired target character at every one of the 4 time steps that we’d like the network to assign a greater confidence to.Since RNN consists entirely of differentiable operations we can run the backpropagation algorithm(this is just a recursive application of the chain rule from calculus) to figure out what direction we should adjust every one of its weights to increase the scores of the correct targets (green bold numbers).We can then perform a parameter update ,which nudges every weight a tiny amount in gradient direction.If we feed the same inputs to the RNN after parameter update we would find that the scores of the characters (e.g “e” in the first step) would be slightly higher (e.g 2.3 instead oif 2.2),and the scores of incorrect characters would be slightly lower.We then repeat the process over and over many times until the network converges and its predictions are eventually consistent with training data in that correct characters are always predicted next. Lets say we want our RNN to predict the last word in the text “ I grew up in France… I speak fluent French”Recent information suggests that the next word is probably the name of a language ,but if we want to narrow down which language , we need the context of France , from further back. It’s entirely possible for the gap between the relevant information and the point where it is needed to become very large.Unfortunately as the gap grows ,RNNs become unable to learn to connect information. The gradients tend to either vanish as the gap grows , this makes gradient based optimization method struggle. New architecture based on RNNs where invented such as LSTM (Long Short Term Memory) and Gated Recurrent Units which are modified versions of RNNs. Previous Post:Great article, I have been looking for something like this! Next Post:Uber’s Code-Free Ludwig: Deep Learning for Dummies?